Get away for an epic week of adventure, challenge and friends! JH Aotearoa Second Wind is the next step on your everlasting adventure if you’ve already been through a Parent & Child Programme. This time it’s just young people like yourself. You’ll be in a team Huddle Group, conquering the challenges put in front of you while learning about what it takes to truly succeed in life. As you finish the ropes courses and enjoy the adventures, you’ll be experiencing a program that intentionally teaches biblical principles about life, leadership and relationships through every challenging adventure. It’s an opportunity to find out who you really are and who you’re called to be in life. Second Wind is the next step in further discipleship of our rangitahi (the younger generation), in empowering them to own their faith in God and discover the next step in His plan and purpose for their life. This week-long adventure is a high school leadership program, which is both challenging and character building, and heaps of fun. It is designed to help young people make wise life choices, and take ownership of their faith, and values through the process of practical application, and adventure activities. Where is Second Wind? 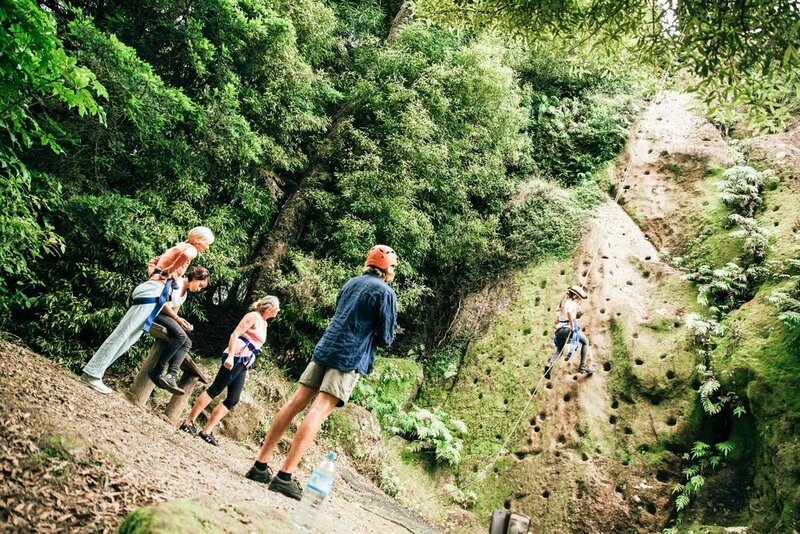 The whole experience is based out of Rotorua at Tui Ridge Adventure Park and will include time at local adventure spots around the region throughout the week. Second Wind shares the site with our Parent & Child Adventure Experience which runs at the same time. What is the best way to get to Tui Ridge? Your student can be dropped off, or car pool with others to Rotorua, or if they bus or fly in - we can arrange a designated JH crew member to pick them up from the Rotorua Fenton St bus Depot or the Airport. Is there anything specific that my student needs for this Event? A detailed list will be provided in the ‘Adventure Prep Packet’ that is sent out with registration confirmation. But to summarise - All the normal things are required like summer, sports and warm clothes, sleeping bags (a good one is necessary for the overnighter), 3x 1.5L drink bottles, towels, sneakers, normal toiletries and any of the students specific personal medication. If possible it would be great if students could also bring a hiking pack - this is something that if you ask around on Facebook most families can source through family and friends. Who can come? This year we are taking registrations only from young people who have previously been to a Parent & Child Adventure Experience either in New Zealand or the USA. What age should you be? 15 - 18 Years of age. The programme is designed for students in their last three years of high school or of an equivalent age. What is the cost for Second Wind? $995 per person. This will cover accommodation, all adventure activities, travel to adventure locations while at Event, health and safety aspects and all meals, for this week long adventure experience. When is the ideal time to register? Immediately of course! But definitely before the 15th December 2019 because that’s when registration closes for the summer.